Is the Mon & Brec about to breach again? THE start of the cruising season and the Mon & Brec is closed yet again with Canal & river Trust carrying out an 'emergency repair' to its embankment at Llanfoist. Yet the Trust had only issued a towpath closure notice from 26th February to 19th May inclusive, though the waterway is closed, with the repair the result of an injunction from the worried residents for it to drain the water from the section of the waterway that runs above houses that are threatened by flooding should another breach occur. The concern of the residents of the houses can be understood as in the past the waterway has breached, flooding the properties, (pictured) so the work on the embankment has caused great concern to the residents situated below. 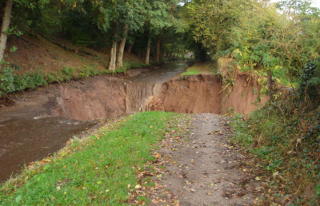 The great problem of the Mon & Brec is that it is mainly built on sandy soil and is very susceptible to embankment breaches, the worst being on the 27th October, 2007 when the embankment completely failed, as can be seen from the photograph, with the cascading water flooding properties at Llanfoist and even resulting in families being given emergency accommodation and closing the A4077 that was flooded. At that time 23 hire boats were stranded away from their bases. The photograph below shows the breach. 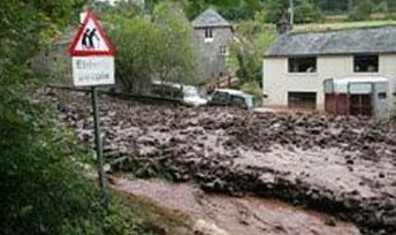 Since then there have been many breaches on the Mon & Brec with a further one on the 27th February 2010 in the pound that was repaired after the 2007 bank collapse, with the pound between bridges 116 and 118 drained to protect properties below. Later that year on the 1st September the embankment by the aqueduct at Llangattock gave way. Then on the 27th October 2012 the waterway was closed after another 'serious leak'. Then on the 7th January 2014 there was embankment movement, again at Llanfoist. The photograph shows the repair on the Llanfoist breach.